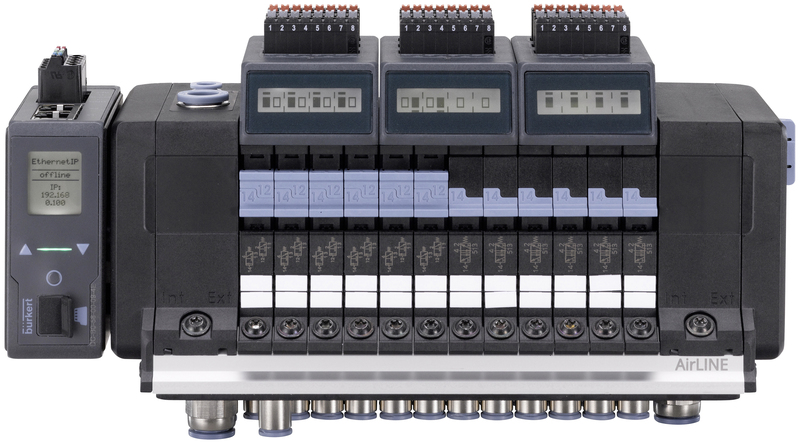 Bürkert presents its new valve island AirLINE (Type 8652) for control cabinets. The valve island is easy to install and its integrated monitoring and diagnostic functions improve process reliability. Type 8652 was designed for applications in the pharmaceutical, cosmetics, food and beverage industries as well as for water treatment applications. It offers users adjustable monitoring and diagnostic functions that improve system availability and process reliability, while at the same time enabling preventive maintenance. An integrated display for this purpose shows detailed on-site information such as the current switching statuses of the pilot and process valves, issues a message if pre-set pressure limit values are exceeded or displays errors such as cable breaks in plain text. During development, particular attention was also devoted to the compact design. The valve island 8652 is significantly smaller than its predecessor and therefore fits perfectly into compact control cabinets that can be placed close to the process valves.